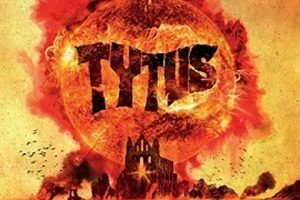 Bringing a wide array of traditional and thrash influences under a NWOBHM and rock and roll umbrella, Italian band Tytus are making their presence felt through their brief discography since forming five years ago. Fortunate to take in their debut album Rises from 2016 and the current Rain After Drought, there is an energetic spirit pulsating through their songwriting and performances – channeling influences from the 70’s and 80’s while creating material that will hopefully gain cross-generational appeal. Twin guitar action, high octane vocals, and tempos that can be Maiden-esque one moment, and early Metallica/Mercyful Fate-ish the next keep ears riveted. Vocalist/bassist Markey Moon took the time to answer these questions regarding Tytus. In this talk we tackle the origins of the band and their sonic transformation, the change in record labels between albums, differences between the two records, and also a decent amount of talk regarding their outlook on metal and favored mediums. 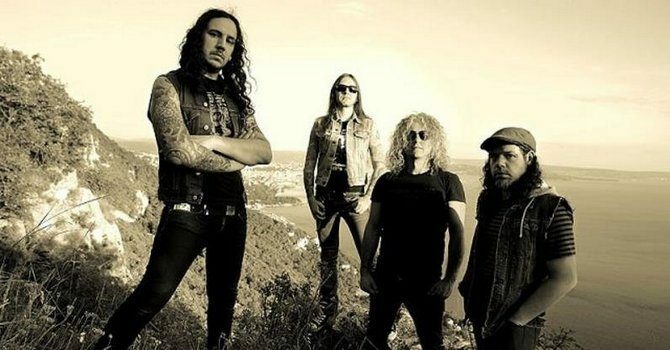 Dead Rhetoric: Tytus began in 2014 – can you tell us about the early formation of the band, and how you decided upon the blend of 70’s/80’s influences of hard rock, traditional heavy metal, and speed/thrash? Markey Moon: Before Tytus myself, (guitarist) Mark (Simon Hell) and (vocalist/guitarist) Ilija (Riffmeister) played together for many years in a punk rock and roll band. It happened that at a certain point we started to move away from that sound, resuming long forgotten listening material from our teenage era and finding ourselves finally able to play it right! Since it was a lot of fun, it felt quite natural to keep going in that direction, and since the new stuff we were composing was getting very different from what we did before, we decided it would have been more honest to change the name to Tytus and start a new adventure. The first line up was actually the whole Gonzales band. Then the singer and drummer left, so we changed a bit more and became the four-piece combo we are now. The speed/thrash element came in with the new drummer’s playing and taste, and in fact is more evident in this second album, in which his contribution is absolutely relevant! Dead Rhetoric: In 2015 you released your first single “White Lines” featuring “New Dawn’s Eve” and the title track. How do you believe this initial recording session went as a band, was it a challenge to decide what two songs to release as a single and how do you believe the critical/ public response was for this release? Moon: They were the very first songs we made as Tytus that finally made complete sense to us. We liked them a lot and we were actually curious to see what the response we could get from the outside playing this stuff. So we decided to record them and put out a 7″, as in the good old days. The sessions were really good and fast, because we spent so much time in the rehearsal room to forge our new sound, so we were all very prepared. Dead Rhetoric: How did you attract the attention of Sliptrick Records who would release your debut album Rises in the fall of 2016? Do you feel like you had more seasoning and growth as far as rehearsals and live gigs under your belt when it came to the songwriting for this effort? Moon: About Sliptrick, we had the album completely recorded and were looking for a label to release it. So we contacted some labels we were following and whose activity was interesting regarding their jobs with bands we liked. Sliptrick came out with a good deal so we decided to sign with them. Songwriting for Rises was very instinctive, the basics of it came out in rehearsal sessions. So yes, once settled in the new direction the band was going to follow, playing and playing in a new mood of course helped a lot to evolve the mood itself! We also had the chance to test some of the new stuff live and check the reaction of the public, and this helped a lot in defining the shape of the songs. Dead Rhetoric: What are your thoughts on Rises at this point a few years after its release? Can you talk to us about the recording sessions and if there were any surprises, obstacles, or challenges that came up regarding the initial songwriting to final output? Moon: I personally still like it a lot! After all it sounds very instinctive, showing at times hints of a certain naivety which gives it a kind of personal freshness. This said, it was quite a long job to put it together: songs were ready to be recorded but we had to face a hard line up change, going from a five-piece to a quartet, with a new drummer and a lead/rhythm guitarist to take care of vocals as well. So we had to rearrange a lot, but it was very interesting! Recording was fine as usual. We did our best to eliminate overdubbing in order to have it sound as ‘live’ as possible. To sound on record as we sound live is one of our main goals!! Dead Rhetoric: Your latest album Rain After Drought finds you now on Spain’s Fighter Records. Why did you decide to change labels, and what changes (if any) did Tytus keep in mind for this follow-up release? Moon: After the experience with Sliptrick we were looking for a label a bit more ‘in the scene’, nearer to our sound and the environment we move in. We are very happy that Fighter Records showed a great interest in us since the first moment: we had some demos and sent them and they were absolutely supporting us from the beginning. As I said, the new release has been strongly influenced by the personal taste and composing skills of our new drummer. This time he was involved in the songwriting process since the beginning and this made things very different and, I must say, a lot more exciting. Dead Rhetoric: There seems to be an emphasis on loads of twin rhythm/ harmony tricks throughout this set of songs, with inevitable comparisons to acts like Judas Priest, Iron Maiden, Metallica, and a host of other NWOBHM acts. Are there certain aspects that the band tries to keep in mind when developing material for Tytus as trademarks? Moon: Yes! The bands you named are basically the quintessence of what we like in this kind of music (and by the way, but it’s important to say, we speak about early Metallica, of course). They all individually set a new branch on a common tree, often influencing each other and going a bit further every time. We have tried (and still do) to assimilate those different elements by playing and playing, in an effort to walk the same paths without merely stepping on the exact same footprints. We love that sound and that atmosphere, and we think that there is still something to say in there, if you are brave enough to take that stuff in your hands again. We also want to keep alive our kind of rock and roll attitude, which is in our DNA thanks to our past musical experiences, and try to mix everything together in a blend of flavors of our own. Dead Rhetoric: What can you tell us regarding the cover art for the latest record? Was it a back and forth, collaborative process between the artist and the band, or do you give them free reign to come up with something appropriate based on the music that you play? Moon: It has been something in between. We were looking for something that could visually summarize our music but also the idea behind this album. While writing it we concentrated on water. On how important it is for life, how hard it is when it’s difficult to get, how destructive it can be when it goes out of control. By extension we then reflected on how foolish it is to keep blindly exploiting the few resources of our planet, perpetuating destructive lifestyles set for us by greedy lobbyists that will lead us to an announced climate apocalypse. For their own sole profit and with the complicity of governments of any color everywhere. Solo Macello, the graphic designer, had some good ideas, we had some others and what came out to me is perfect: a tentacular capitalistic monster rules the world and leads it towards a catastrophe where waters of the Earth will rise enough to destroy civilization submerging it, and ends up ruling on ruins. Dead Rhetoric: How would you describe Tytus when it comes to live shows and performances? Moon: This I don’t know, actually… maybe you tell us when you’ll see us live, ha ha! What I do know is that any time we play we try to kick the hell out of our axes and drums. And that it is always a lot of fun, because feedback from the audience is very good. It is exciting, and I’d like to keep this going forever!! Dead Rhetoric: Where would you like to see Tytus develop as a band within the next two or three years? What challenges or obstacles come up that you are hopeful to conquer in your quest to develop a stronger, bigger following not only within Italy, but across the globe? Moon: I would like to see us playing in the US and in Japan. And I would like it to be sooner than that, ha ha! Also being part of the line up of the Keep it True German festival, some day, would be great! Sooo cool! 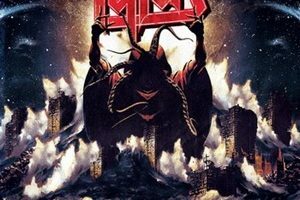 Dead Rhetoric: What does heavy metal mean to you personally? Moon: It is a way of making music in which I find everything I like to do, musically speaking! It has power, freshness and immediacy but it needs a good amount of musicianship and dedication to be understood, and for this reason it can also be a good medium to try to communicate something intelligent with! Dead Rhetoric: How do you handle the changing promotional landscape where some people like music in digital/streaming forms while others prefer the physical product of vinyl, tapes, and CD’s – do you favor one medium over another? Do you believe social media and the internet has made the playing field equal for bands to connect and develop following direct with their fans beyond the help of record labels? Dead Rhetoric: What do the band members like to do in their free time as far as hobbies, activities, and interests when they are away from music? And how do you handle the challenge of pursuing a band while also having full-time jobs and families/friends to balance out? Moon: I am NEVER away from music, ha ha! Whatever I do there’s always something pumping out a stereo or headphones, or somebody playing around. Being such an important thing in my life, it is not that difficult to keep it going aside of family and a regular job. It’s like drinking or eating: the difficult thing is to do without music!! Dead Rhetoric: What’s on the horizon for Tytus over the next twelve months as far as live activities, promotional videos, etc.? Moon: This is a very exciting moment for us, we are busy promoting RaD in the best possible way! We are rehearsing a lot to build up a killer show that we will perform in Italy and abroad, a bunch of gigs have been already booked and more are to come, we will officially comunicate where and when through our channels in a short while. We are working on a new video and, as said, I hope the vinyl version of the album will be out soon as well. Meanwhile we are also working on new songs for the next album.